When Kerry and Lucy Madden-Lunsford say there’s nothing fancy about Kathryn (Tucker Windham) and Charlie (Lucas), they are only half-telling the truth. On one hand, the authors spin a wonderful tale about two friends, bonded together by their love of simple things like tomato sandwiches and turning combs into homemade musical instruments, which indeed establishes the two as people who do not feel the need to surround themselves with fancy things. Kathryn and Charlie come across as individuals who are as eccentric as they are down-to-earth, so I can definitely see how there is nothing fancy about the pair. However, the way these characters are portrayed visually is something fancy in itself. The illustrator, Lucy Madden-Lunsford, expertly uses color and texture to make the characters come to life by utilizing both drawings and actual materials such as fabric to liven up the images. This technique, when applied to characters’ outfits, makes for excellent characterization, as it feels representative of real clothing while also serving as an aesthetically pleasing piece of their overall images. The difference between Kathryn’s chunky-stitched, multicolored clothing is quite different from Charlie’s understated denim wardrobe, which brings attention to the difference in Kathryn and Charlie’s personalities. Thus, as far as characterization is concerned, the use of textiles is an excellent visual cue that reiterates the point made by the text: two drastically different people can develop a beautiful friendship. The integration of 3-D materials such as fabric and yarn highlights other aspects of the narrative as well. Kathryn and Charlie are both creative individuals, although they may express it in different ways. It is only fitting that the illustrations of a story about a talented storyteller and a self-taught folk artist are a combination of 2-D and 3-D. In a way, the use of these materials transforms every page into an image reminiscent of Charlie’s eclectic sculptures. 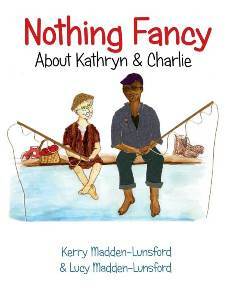 Although Nothing Fancy About Kathryn & Charlie is aimed at a young demographic, I believe it can be enjoyed by readers of all ages. It’s wonderful that this book will introduce two of Alabama’s finest artists to a younger demographic. Lindsay Hodgens is a double English/sociology major at the University of Montevallo.